Home / Plans & Paperwork / Announcing Our Structural Engineer! As we mentioned previously, we had to have a structural engineer contribute some documents towards the pack we sent into the Swartland Municipality for the plans to be approved. Another company was kind enough to supply the documents so that we could continue with the application process. However, we had a nagging suspicion that this company was possibly not quite one hundred percent right for us. We know that they are a good and reputable company, but we just don’t think they are the perfect fit. At the time we were on the search for a geotechnical engineer and Kevin remembered John Moll. Kevin worked with him previously on a project. Therefore, Kevin decided to see if he could get hold of his contact details once again, hoping that John could recommend a geotechnical engineer (they seem quite rare). Kevin finally made contact and it turned out that John is a geotechnical engineer, as well as a structural engineer. The obvious decision for us was to kill both proverbial birds with one shipping container and ask John to forward us a quote for his services. Before long, we had the quote and were welcoming John to our project! Now we had to notify the Swartland Municipality of our change of structural engineer. John forwarded us the necessary documents that we had to submit. We printed them out and signed them. Handing them in was a bit of a nothing event. They thanked us and promised to add them to our file. And that was that. We have also notified the original engineers of our change of plans. 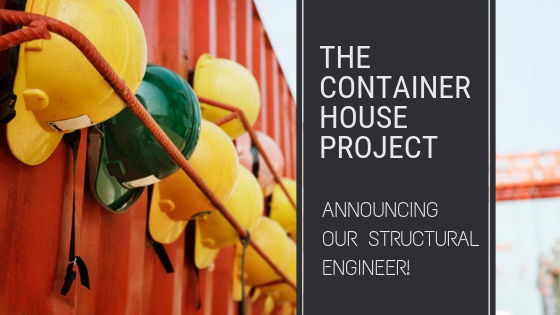 The structural engineer is responsible for making sure that our house will be safe to live in. The architect draws up the plans of what the house will look like, but the structural engineer tells us how to build it so that it is safe. His first responsibility will be in determining the size and strength of the concrete footings on which the shipping containers will sit, and we will adjust our previously dug holes as required. John’s first visit to our construction site will be when we have dug all the holes for the footings, to his specifications, as well as the channels for plumbing pipes, but before we pour any concrete. We are looking forward to that day because we’ll be able to start seeing some physical progress on the project. There is a lot of preparation work to be done so we will most likely be hiring a TLB to level the ground and help with the digging of the plumbing channels, etc. If you would like to make use of GM Civil Engineers’ services for your own project, you can obtain their details from our directory. We’ve been promising you something absolutely awesome for our November Giveaway, sponsored by Adendorff. Here’s a sneak peak picture. If you want to be notified as to when the giveaway is live, sign up to our Newsletter and you’ll be the first to know! Looks very exciting, all the best with your very interesting project. Will be keeping watch on your progress.